Elizabeth King, an assistant professor with a joint appointment in the Odum School of Ecology and Warnell School of Forestry and Natural Resources, helps students appreciate the connectedness and complexity of human-environment interactions. I earned my bachelor’s degree in biology from Reed College in Oregon and my master’s degree and Ph.D. in population biology from the University of California, Davis. I teach general courses on ecology and on natural resource conservation in the university’s Odum School of Ecology and the Warnell School of Forestry and Natural Resources, as well as restoration ecology and graduate courses to students in both schools and from all over campus. I conduct research in two main areas of sustainability science. One area focuses on challenges faced by livestock-herding societies in rural Africa. In many regions, these people are struggling to secure sustainable livelihoods in the face of drastic environmental and social pressures. My work combines ecology and social science to gain a more holistic view of livelihood vulnerability. I’m particularly interested in which households in a community are able to successfully adapt to changing conditions, and what kinds of assets, knowledge and social arrangements give them that ability. The other sustainable science area is restoration ecology here in Georgia. 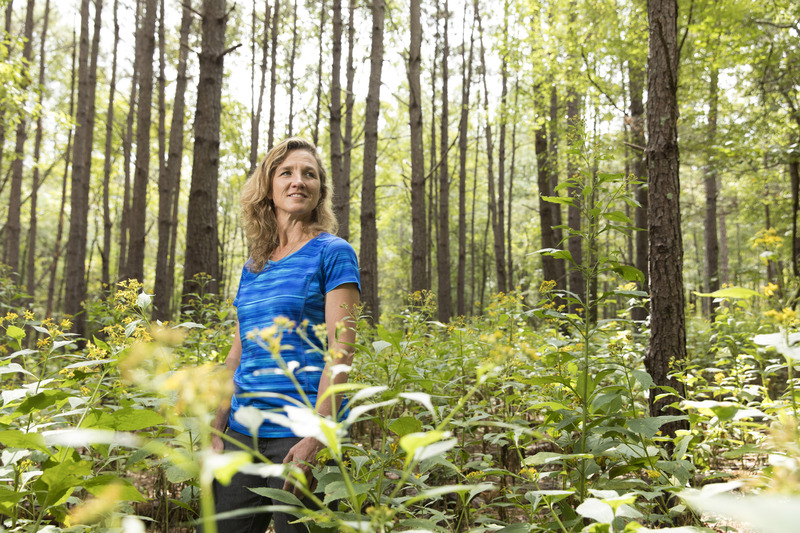 I study how—and why—we repair damaged and degraded ecosystems. Some of this work is on the beautiful barrier islands of Georgia’s coast, and other projects are focused on urban forests right here in Athens. For instance, I’ve had great fun getting involved with UGA’s Chew Crew, which uses goats to remove overgrown and invasive vegetation. I came in 2012, after over five years as a postdoctoral researcher and lecturer at Princeton University. My teaching and research there was the beginning of my journey into highly interdisciplinary research focused on sustainability challenges in African drylands. I was working with scholars in fields ranging from political science to ecology to engineering and hydrology. 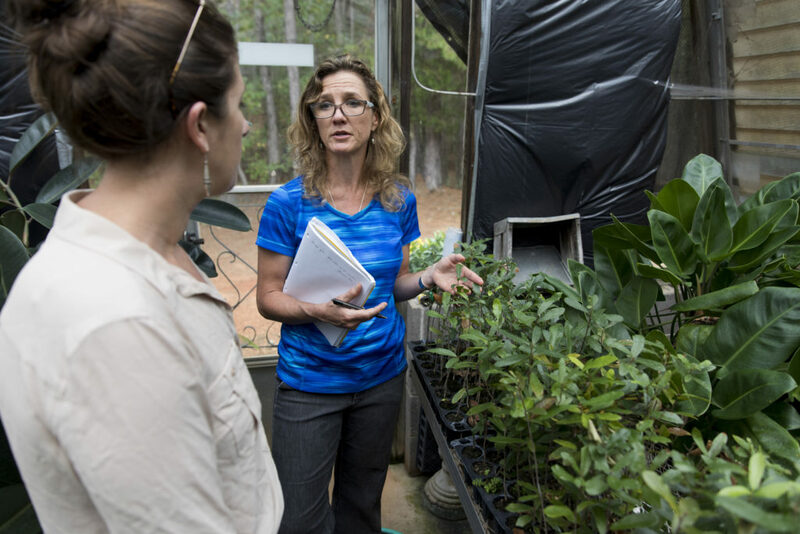 I didn’t know what I would do next, but I was amazingly fortunate to find a position at UGA that welcomed my passion for integrative, sustainability-focused research and teaching. 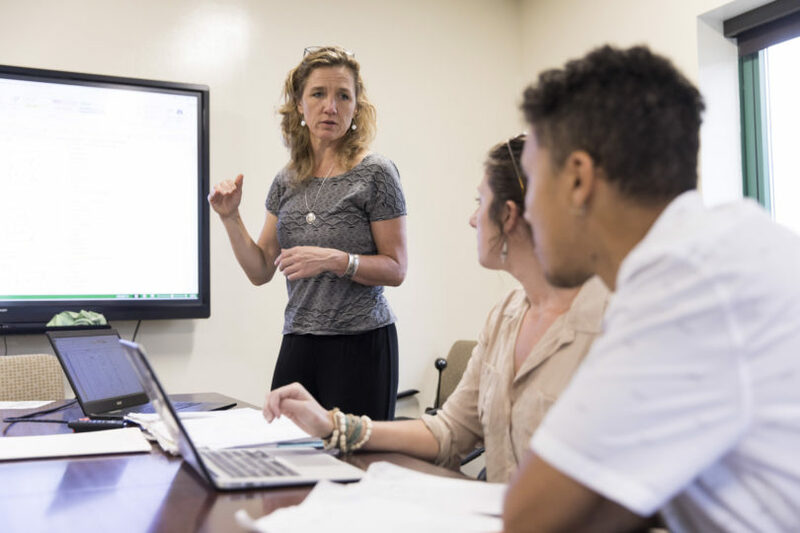 In addition to stellar colleagues in Odum and Warnell, I also was attracted by UGA’s notable strengths in environmental anthropology as well as the newly founded Integrative Conservation (ICON) Ph.D. program, where I knew great collaborations would arise. Last but not least, I’m from the Southeast and really wanted to be back with family, friends and Southern sunshine. Each class I’ve taught has been a rush, a challenge and ultimately a rewarding experience. I teach two large classes, and I love getting into the “it’s showtime” spirit of captivating the attention of a large auditorium and also stimulating genuine curiosity, which then makes learning so much easier. Because of the complexity of ecosystems and multiple human values regarding environmental issues, ecology and natural resources courses are many students’ first exposure to science where there is no single “right answer.” I love facilitating students to see and ask big, hard questions about the world, and to realize that they each have a unique opportunity to answer them. The course in restoration ecology that I designed and teach is great fun, because it is at the nexus of all the things I love about teaching and science. It attracts both graduate and undergraduate students—from Ecology, Warnell and beyond. There is rich scientific theory to learn, yet we also need to learn about the human contexts in which ecological restoration is undertaken, which are studied in social and behavioral sciences. History and aesthetics are interwoven into people’s motivations for ecological restoration, so we bring in artistic and humanities perspectives as well. We talk about everything from plant population models to theories of cooperation in society, because you need to appreciate all those things in order to plan and conduct ecosystem restoration. Each student’s horizons are thus broadened by a course’s interdisciplinary approach. The first large project I embarked upon at UGA has certainly been a highlight. I had recently met Laura German, associate professor in anthropology, and we saw a great opportunity to work together, investigating the ecological and social changes that were unfolding in a community of livestock herders in Kenya. We recruited a stellar Ph.D. student who took the project to new heights, as well as a terrific postdoc who probed deeply into the reasons why people’s lives were changing and the strategies they used to cope and adapt. The experience solidified for me the value of integrating different ways of looking at problems, despite how challenging it can be. The Sustainability Science Symposia that the Center for Integrative Conservation Research hosts have been some of the most rewarding events I’ve experienced at UGA. Seeing how many scholars are focused on sustainability, from incredibly diverse perspectives, makes it very exciting and inspirational to work at UGA. My work helps reveal the ecological cause-and-effect relationships that explain different forms of ecological degradation, with the goal of finding key leverage points to intervene and promote restoration. My work also studies critical social dimensions—”upstream” drivers, and “downstream” consequences—of land degradation and restoration. By looking at the ecological problem in its social, economic and political context, we see the broader landscape of barriers and opportunities for restoration in a much more holistic light. Many efforts to restore ecosystems and re-establish sustainable human-environment relations often fail because of social factors that were not accounted for. By coupling ecological and social science research, we can better avoid those pitfalls. Whichever class I teach, I hope that students gain the ability to see the complex cause-and-effect relations that underlie the patterns and trends we see around us. I also hope that students learn to appreciate that everything happening in the world today is governed on some level BOTH by scientific principles and by human values and actions. The connections may be indirect, but they’re there, and they’re important to grasp in order to think about sustainability. By teaching in a way that shows my own enthusiasm and wonderment for learning about complex relationships, I hope that students are excited and empowered as they develop their abilities to discern those connections. One of my favorite quotes is by John Muir: “When we try to pick out anything by itself, we find it hitched to everything else in the Universe.” I’m endlessly fascinated by the connectedness and complexity of ecosystems and human-environment interactions. So I particularly appreciate students who also get excited by the complexity we discover as we examine the world around us, and who like to look at problems from different, new perspectives. When students are open to different perspectives, they can learn so much more about any place, creature or situation, which makes teaching and mentorship exciting and fun. A stroll or lunch in the Founders Memorial Garden. It’s serene, harmonious and always gracefully reflects the season. The phrase “Southern charm” comes to mind whenever I visit. What a treat to have such an oasis nestled into campus, to visit for a minute or an hour. I like to meet with students outdoors—sitting, walking or having coffee—if we’re catching up on life or thinking broadly about new ideas. And the Founders Garden is an ideal spot to calm the mind and get creative. Travel! Seeing new landscapes and new cultures is my greatest pleasure. It’s rewarding in terms of seeing new beautiful things, but it’s also deeply rewarding as a learning experience. Seeing and learning how different the world is in different places is for me a profound source of inspiration, wisdom and humility. Whether it’s right around the corner in Georgia or on another continent, there’s always something new and different to appreciate. Travel is my most treasured source of learning. Since 2013, I’ve been working with the UGA Chew Crew, a project that uses goats to clear out overgrown invasive vegetation on two campus sites. I’ve helped coordinate the citizen science efforts to monitor the effects of the goats on vegetation. Interestingly, the most rewarding part of this has not been the ecological changes that goats bring about, but the human changes that they bring about. Volunteers love working around the goats. The goats make restoration fun, they stir up new feelings of environmental care and stewardship in the volunteers and get kids, college students and community members excited about playing an active role in improving their environment. In a way, I hope to never have a single favorite book or movie! There are many at the top of the list, and in keeping with my academic tendencies, they are wildly diverse. But the most recent addition to the favorite book pile, which I read this summer and still get swept away thinking about the beauty of many of its ideas, was “Braiding Sweetgrass” by Robin Wall Kimmerer. The author is a botanist and a Native American. Her essays reveal fascinating complementarities between indigenous and scientific ways of knowing and how they have shaped her as a scientist, a mother, a teacher, a learner, a citizen and an environmental steward. She is a remarkable storyteller, and in her stories the plants are themselves the teachers. As we learn about them, we also learn about ourselves. The book was full of ideas I had never heard articulated before; it was lyrical, personal, scientific and inspirational. And then, totally different, I also love Carl Hiaasen novels, which are like kaleidoscopes of hilarious, edgy, completely absurd, “only in Florida” escapades. A few months after arriving, I was a marshal during the spring Commencement ceremony in Sanford Stadium. That afternoon, I learned a lot about my new home and community, and kind of fell in love with UGA. First, on the walk over to the stadium, I saw some parents and grandparents tailgating graduation! They were cheering on the seniors in their robes as they passed by. I thought that was just awesome. Then, when I walked alongside the joyous, cheering graduating seniors onto the field, I got pretty choked up when I saw the thousands and thousands of family members and friends in the stands, beaming with pride, excitement and love. I think of that moment frequently, because it’s an important reminder that—even though I meet hundreds of students—each person’s experience at UGA is a unique, once-in-a-lifetime journey. It’s humbling to think about the role that I get to play in many of those journeys.